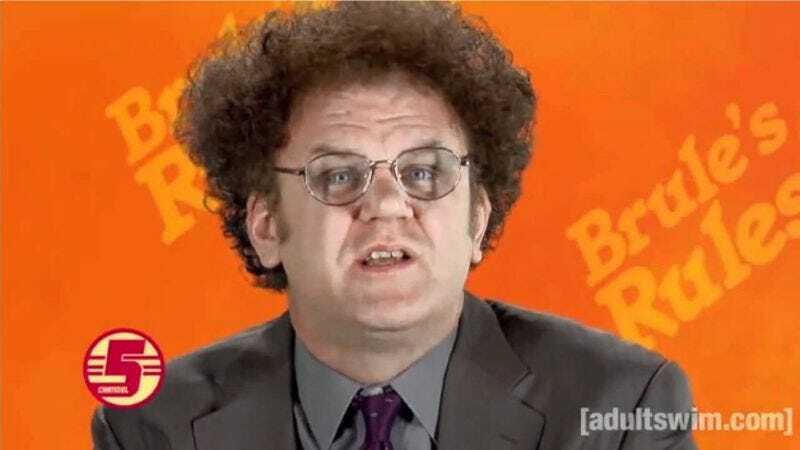 Dr. Steve Brule is a character created for Tim & Eric Awesome Show, Great Job! and portrayed with thespiatic verve by John C. Reilly. Brule appeared mainly on a show within that show, specifically the Channel 5 news segments and “Brule’s Rules.” Then Dr. Brule spun off into his own show, called Check It Out! With Dr. Steve Brule, which followed the dim doc’s adventures in learning about himself and other people over three seasons. So that was a show spun off from a show within a show. And now there’s Bagboy, a 30-minute sitcom pilot starring John C. Reilly as Dr. Steve Brule as a bagger named Steve, who’s just trying to make his way in the grocery business. Audiences on the recent Tim & Eric tour (which also featured Reilly as Brule) were shown five minutes of the pilot, which was created and filmed—as most of the T&E universe has been—for Adult Swim. Now Entertainment Weekly is reporting that the pilot episode will finally be made available for general consumption on Friday, February 20; perhaps fan reaction from the tour was loud enough to unbury what looks like another insane gem, not to mention a spin-off of a spin-off of a show within a show. It features a bunch of Tim & Eric regulars, as well as a cameo from Mickey Dolenz of The Monkees. Below, a totally bootleg YouTube video of the first five minutes, because EW’s one-minute clip is not embeddable. For your health!